Originally developed as a golf course community, Mill Creek is exceptionally well-planned and has managed to retain much of its small town charm over the last several years of growth and community development. Developed in 2002, Mill Creek Town Center is a lifestyle center featuring more than 80 shops, restaurants and services. 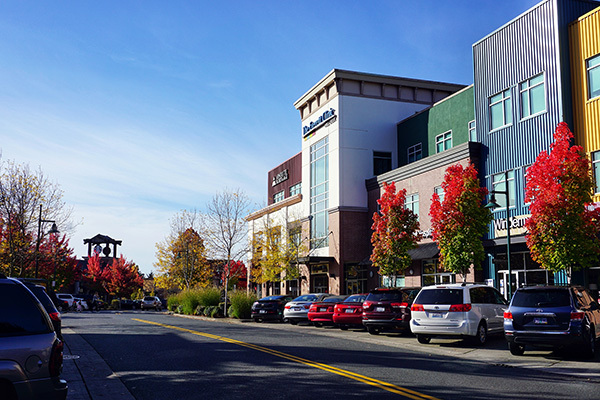 It attracts residents and visitors to dine, shop, relax and explore, and recently was named “the best lifestyle center in Washington state.” The growth of Town Center as a pedestrian-friendly shopping destination, as well as the development of other businesses along Mill Creek’s main corridors, supports economic development goals. In addition, there are newer developments (such as those along the 132nd Street SE and 164th Street SE corridors) and growth opportunities that provide diverse offerings for Mill Creek residents and people from neighboring communities. Aside from the landscape, buildings, shopping and services, the character and personality of the community is defined in large part by Mill Creek’s residents. Even the casual visitor will soon notice the residents care about their city and their fellow citizens. In addition to attractive neighborhood and community parks, the City is home to the Mill Creek Sports Park, which serves 3,825 youth annually and is home to many soccer, baseball and softball teams. Parks and trails are a hallmark of the city, with over 23 miles of nature trails including the scenic North Creek Trail that runs along the North Creek Greenway from McCollum Park to the southern city limits. There is also a private golf course around which the original community was built, as well as a nature preserve through which Penny Creek flows. Mill Creek Sports Park provides a highly desirable venue for baseball, softball and soccer. In addition to serving thousands of youth annually, it is used for several regional and state tournaments each year. In addition, the community uses it when not occupied by rental groups. The popular Arena Sports and Entertainment facility opened in 2017. This 98,000 square-foot facility features indoor soccer and futsal fields and programming, as well as a full-service family entertainment center that will include bowling (mini and full-size lanes), a multi-floor laser tag arena, rock climbing tower, two-story indoor ropes course, inflatable FunZone, and more than 100 arcade games. The expansive facility is a premier party and event destination and sporting facility to the area. Being close to the Puget Sound and the snow-capped peaks of the Cascade Mountains, recreational opportunities such as boating and skiing are just a short drive away. Nationally ranked year-round golf courses are nearby. Mill Creek’s climate is temperate and relatively mild. The area’s reputation for rainy days comes from the frequency and not the total accumulated rainfall. In fact, its annual average rainfall is approximately 36 inches, less rain than New York, Atlanta, or Houston. Summers and early fall are marked by gorgeous, sunny days. Mill Creek is served by the Everett Public School District and has an elementary school, a middle school and a high school all within its boundaries. Seven excellent colleges and universities are found within a 17-mile radius. Major employers in Mill Creek are businesses such as Albertson’s Food, Central Market, The Everett Clinic and Lowe’s Home Improvement. The regional economy comprises businesses in several sectors, including aircraft design and manufacturing, technology, biomedical, and travel and tourism, among others. The City’s population of 20,470 ranges from young families to seniors, which is a testament to the livability of Mill Creek. The median age is 41 which is slightly above the national median age of 37.2. Community residents are well educated; 96% have a high school diploma and 49% have a bachelor’s degree or higher. The average family income is $101,061 with only 5% of all families falling below the poverty level. Primarily residential, the city is composed of a mix of single-family homes, townhomes, and apartments set in a lushly landscaped environment. More than 63% of residents own their own homes, and the average household size is 2.4 persons. The median home price is approximately $450,000 (for a four bedroom, three bath, 2,800-square-foot home). Real estate prices range from as little as $320,000 to more than $1 million for homes in an exclusive neighborhood. The City’s residents are Caucasian (74.2%), Asian (16.7%), Hispanic (5.6%), Black (2.2%), American Indian (0.5%), and those comprising two or more races (4.4%).